Professor Dr. Anton Caragea and European Council on Tourism and Trade delegation taken up a tour of city of Baku and a familiarization trip to Autonomous Republic of Nakhchivan, component part of Republic of Azerbaijan. Between 30 October to 5 November 2013 a delegation from European Council on Tourism and Trade (ECTT) was invited for a familiarization trip to Azerbaijan and to Autonomous Republic of Nakhchivan in order to analyze touristic opportunities offered by this beautiful country in the Caspian Sea Region. 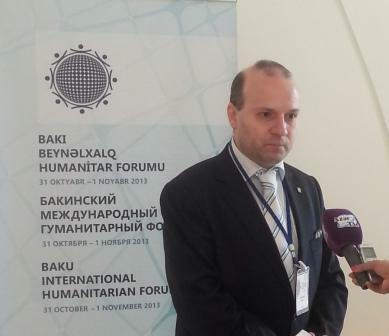 ECTT President Anton Caragea attended the International Humanitarian Forum held in Baku. Also ECTT President Anton Caragea attended from 31 October to 1 November 2013 the International Humanitarian Forum held in Baku, a forum that become the world center of cultural and academic elite. Upon the invitation of Foreign Minister of Azerbaijan-Elmar Mammadyarov, Professor Dr. Anton Caragea, President of European Council on Tourism and Trade attended as key-note speaker to the forum activities. In his allocution, Professor Dr. Anton Caragea, President of European Council on Tourism and Trade had openly thanked President Ilham Aliyev for the initiative to host this high standard forum that has the potential of creating a global world dialogue platform, in order to create a XXI century world without humanitarian crisis, a world of social equity, equal chances and sustainable development. After the forum works where concluded, Professor Dr. Anton Caragea and European Council on Tourism and Trade delegation taken up a tour of city of Baku and a familiarization trip to Autonomous Republic of Nakhchivan, component part of Republic of Azerbaijan. 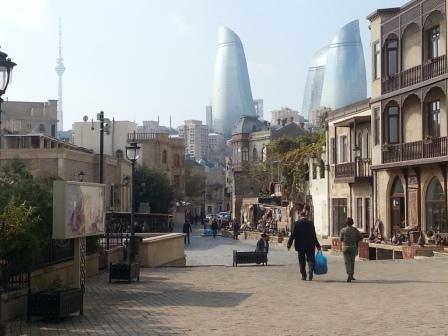 Tour of Baku: city of modernity and architectural daring and historical preservation. Nakhchivan Opera concert in honor of Professor Dr. Anton Caragea delegation. President of European Council on Tourism and Trade, Professor Dr. Anton Caragea had stated in a television interview for National Azeri Channel that: Baku is today a symbol metropolis that is respecting the past and building a powerful mega polis in line with XXI century requirements and magnificent located on shores of Caspian Sea. The visit to Azerbaijan was held between 30 October and 5 November 2013 and was inscribed in the bilateral expressed desire to develop the strategic partnership and in order to better appreciate the cultural, economic and civilization model offered by Azeri society to European tourists. On 13 of February 2012 a friendly and cooperation meeting between Prof. dr. Anton Caragea, President of European Council on Tourism and Trade and H.E. Mrs. Marta Fajardo Palet, Ambassador of Republic of Cuba had taken place. Prof. dr. Anton Caragea express his amicable fillings and friendly interest towards the recent evolutions in Cuba, that are consolidating Cuba`s economic development, open society and are creating a sense of perfect unity between the people of Cuba and the government. Cuba`s revolutionary transition under Commander Fidel Castro supervision and President Raul Castro guidance is witnessed with sympathy and interest in Europe, emphasized prof.dr.Anton Caragea . H.E. Ambassador Marta Fajardo Palet presented the latest achievements in bilateral relations : opening a bilateral chamber of commerce, developing cultural relations and building new bridges of understanding between European Council on Tourism and Trade and Cuba. The parties had appreciated that between European Council on Tourism and Trade Romanian and Cuba there are large area of common interests , designed to forge a good understanding between the two organisms . The European Council on Tourism and Trade- Cuba relationship must be an example for a better relation between Europe and Latin America . If in the last decade the bilateral dialogue with this area was faltering, now it is a auspicious moment for reconstructing and rebuilding this framework of dialogue and friendship. The dialogue had continued on concrete aspects and analyses of economic, tourismpolitical and cultural bilateral relations and on ways of fostering this dialogue on to the future . H.E. Mrs. Marta Fajardo Palet, Ambassador of Republic of Cuba presented on this occasion the candidature of here country to WORLD BEST TOURIST DESTINATION AWARD. Also the parties had evoked the history of bilateral relations and the marking in this year (2012) of 85 years of bilateral diplomatic relations and the commemoration last year ( 2011) of 50 years of diplomatic relations at ambassador level. On 30 of January 2012 the taking office protocol meeting between Prof.dr.Anton Caragea, President of European Council on Tourism and Trade and H.E. Mrs.Z. 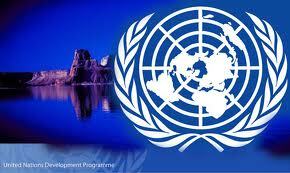 Coromoto Prieto de Rodriguez , Charge D`Affairs of Bolivarian Republic of Venezuela had taken place. Prof.dr.Anton Caragea express his heartfealted congratulation on the occasion of beginning of mandate of H.E. Z .Coromoto Prieto de Rodriguez appreciating that between Europe and Venezuela there is a large area of common interests , designed to forge a good understanding between the two nations . The Europe- Venezuela relationship must be an example for a better relation between Europe and Latin America . H.E. Mrs. Z. Coromoto Prieto de Rodriguez had expressed here appreciation for the encouragement`s offered by prof.dr.Anton Caragea and had stated that the vision of a economic, tourism , politic and cultural special relationship between Europe and Venezuela is a shared vision. The dialogue had continued on concrete aspects and analyses of economic, tourism and cultural bilateral relations and on ways of fostering this dialogue on to the future . H.E. Mrs.Z. Coromoto Prieto de Rodriguez , Charge D`Affairs of Bolivarian Republic of Venezuela presented his country candidature for WORLD BEST TOURIST DESTINATION AWARD . The dialogue led the foundations of a successful diplomatic mandate and fostering the relations between Europe and Venezuela and is constituting a promise for re-launching a european diplomatic action towards Latin America in the nearest future. Prof.dr.Anton Caragea, President of European Council on Tourism and Trade receives a portret of Simon Bolivar-Venezuelean Hero from H.E. Mrs.Z. Coromoto Prieto de Rodriguez , Charge D`Affairs of Bolivarian Republic of Venezuela. 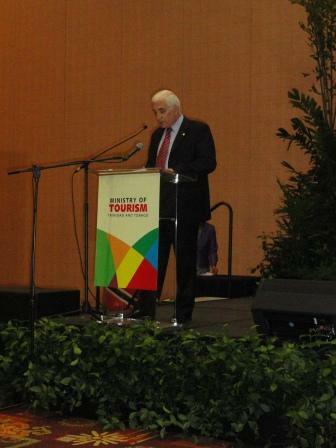 Between 25 November -4 December 2011 an european tourism delegation chaired by Professor Dr. Anton Caragea, President of European Council on Tourism and Trade, attended the 40-th National Day Celebration of United Arab Emirates in Abu Dhabi, at the invitation of United Arab Emirates National Media Council . Prof.dr. Anton Caragea and Minister of Tourism and Chairman of Organizing Committee for UAE 40-th National Day Celebration: H.H. Sheikh Sultan bin Tahnoon. The visit of the european media delegation in United Arab Emirates is yet another demonstration of the ever deepening ties between European Union and United Arab Emirates in fields of tourism, culture, media, economy and political dialogue. It is a rare occasion and a friendship declaration when European delegation attend National Day Celebration of another country and this is a supplementary demonstration of the brotherly spirit that unites European Union and United Arab Emirates( UAE). Finally the European presence on 2 December-the National Day of Emirates is an evidence of Europe`s people support for the UAE outstanding achievements and positive model offered to the world, stated prof.dr. Anton Caragea, President of European Council on International Relations upon his return. Emirati traditional dance performed for European delegation. 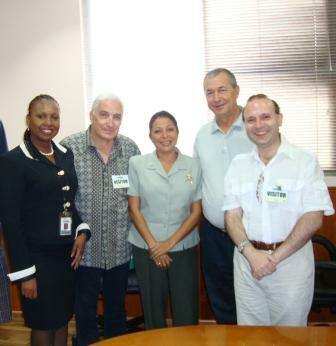 Professor Dr. Anton Caragea- World Goodwill Ambassador for Natural Protected Area`s visiting Chaguaramas Natural Rezervation in Trinidad and Tobago. 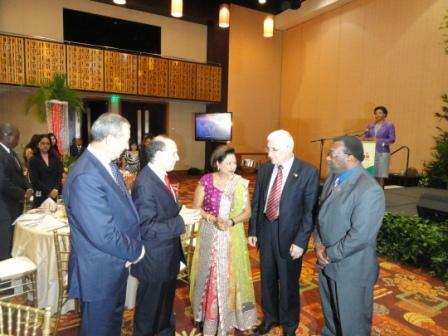 On 19 October 2011, in the framework of European Council on Tourism and Trade official delegation visit to Republic of Trinidad and Tobago , Professor Dr. Anton Caragea , President of European Council on Tourism and Trade bestow upon people and government of Trinidad and Tobago the WORLD BEST TOURIST DESTINATION AWARD for 2012 and declared Trinidad and Tobago as FAVORITE CULTURAL DESTINATION for 2012. The fallowing are extracts from the speech presented on this occasion. 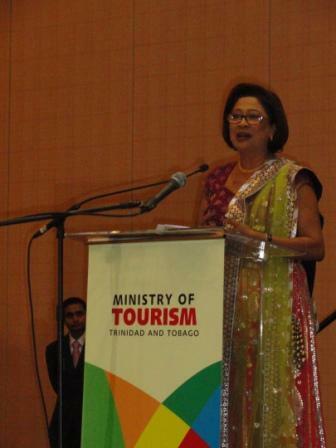 Honorable Kamla Pershad Bissessar is glad: TRINIDAD AND TOBAGO are officially recognized as WORLD BEST TOURIST DESTINATION: Job well done for her country . Honorable Kamla Pershad Bissessar –Prime Minister of Government of Republic of Trinidad and Tobago speaking at WORLD BEST TOURIST DESTINATION Award Ceremony for Trinidad and Tobago. 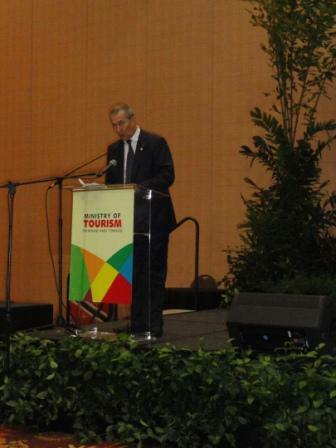 Professor Dr. Mircea Constantinescu –Director of European Tourism Academy praised Minister of Tourism impressive results. Dr. Petru Lificiu, Vice-President of European Union Council on Tourism and Trade , WORLD BEST TOURIST DESTINATION AWARD is the garantee for an ecological , high quality and fair tourism. 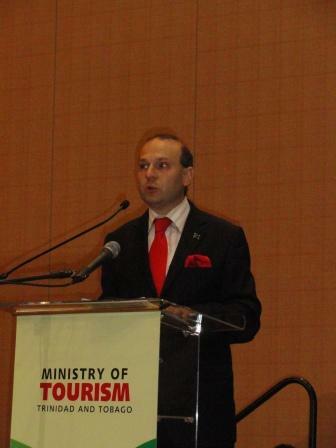 Professor Dr. Anton Caragea , President of European Union Council on Tourism and Trade unveiling the reasons for awarding TRINIDAD AND TOBAGO. 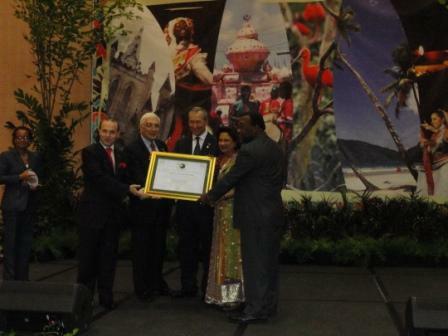 WORLD BEST TOURIST DESTINATION AWARD CONFERED TO TRINIDAD AND TOBAGO FOR 2012.